WORLD NUMBER ONE Rory McIlroy completed a dominant showing by winning the Dubai Desert Classic with a record-equalling score of 22 under par. The Northern Irishman led throughout the weekend at Emirates Golf Club following a superb 64 on Friday, and completed the job with a two-under round of 70 on Sunday that proved enough to hold off a late charge from Alex Noren. McIlroy’s winning score, which put him three clear of Noren, is the joint-lowest at the European Tour event, with Thomas Bjorn and Stephen Gallacher having previously claimed victory with the same tally. The 25-year-old reached the turn at level par for his final round after a birdie at the third was negated by a dropped shot at the seventh, just one of two bogeys McIlroy carded all weekend. McIlroy did not attack the pins with as much regularity as he had on the previous three days, but a good recovery from a bunker led to a birdie at 10. Another birdie at the par-five 13th followed after a missed eagle opportunity and McIlroy was able to wrap up a second victory at the tournament following his triumph in 2009. McIlroy has now claimed seven successive top-two finishes on the European Tour, with this latest success his fourth win in that time. Swede Noren — who missed the majority of 2014 with tendonitis in both wrists — finished in outright second after a surge up the leaderboard. Four birdies and a bogey saw him go out in 32 and he picked up a further four shots on the way home to sign for a seven-under-par 65. Email “A dominant Rory McIlroy has won the Dubai Desert Classic with a record-equalling score”. 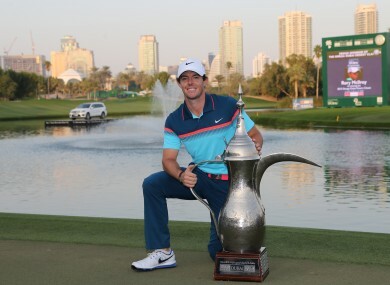 Feedback on “A dominant Rory McIlroy has won the Dubai Desert Classic with a record-equalling score”.